To understand the impact the proposed changes within the new legislation would have on local planning efforts, the authors conducted interviews with over 50 housing advocates, city and county planners, affordable and market-rate developers, consultants, and others active in the world of California housing policy. Four of the 15 bills impact a jurisdiction’s Housing Element – a necessary tool through which jurisdiction’s plan for future housing. To better evaluate how these changes would affect different jurisdictions in Los Angeles County, the authors conducted three Housing Element case studies: Santa Monica, Inglewood, Azusa. Community Scholars is a joint program of the UCLA Department of Urban Planning, the UCLA Labor Center and the Institute for Research on Labor & Employment that provides advocates, community developers and organizers an opportunity to work on a unique applied research project that furthers the goals of the progressive community development in Los Angeles. 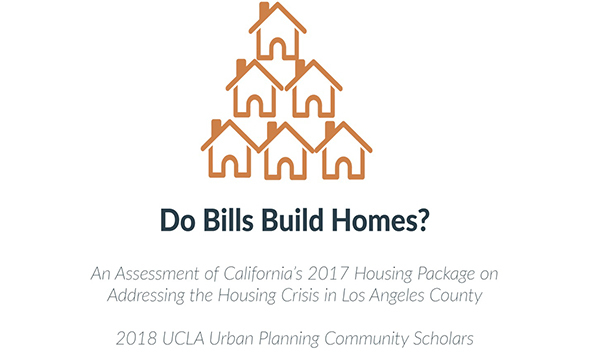 This year, Community Scholars worked with UCLA Urban Planning graduate students to address an important policy challenge and formulate a response that furthers a social justice agenda. The Community Scholars provided research for the Community Development Project of Public Counsel.